Limited Power Outage Scheduled for Tonight in Northern Park View | Park View, D.C.
« 600 B/O Princeton Will Be Part of Residential Parking Permit Program Effective April 16. Pepco is doing some maintenance work in the northern part of the neighborhood and power will be off in the affected area tonight from 11:00 pm to 6:00 am. The outage will impact customers on the 600 block of Rock Creek Church Rd., 600 block of Quebec Pl., 3600 block of Park. Pl., 3600 block of Warder St. NW, and the 700 block of Princeton Pl. NW. Residents living in this area should have already received a door hanger alerting them of the disruption (example below). 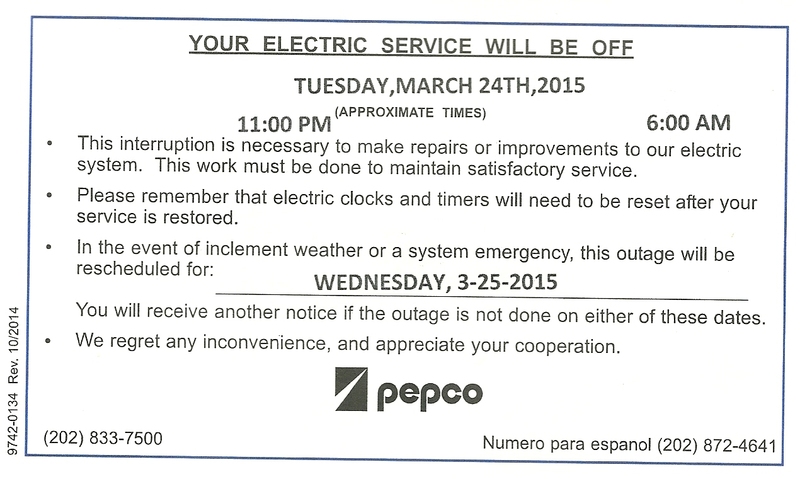 The scheduled outage tonight is so that Pepco can replace a module. As this is an overnight outage, residents on the relevant blocks should plan accordingly with regards to alarm clocks and devices that require charging. This entry was posted on March 24, 2015 at 7:01 am and is filed under Pepco, Restoration repair and maintenance. You can subscribe via RSS 2.0 feed to this post's comments. thanks for posting. We did not get a notice on our door even though we are an affected block.